Claudia Joskowicz, Vallegrande, 1967, 2008, still from a color video, 8 minutes. Of his song “Live Fast, Love Hard, Die Young, and Leave a Beautiful Memory,” country singer Faron Young once remarked, “This was a tune I detested.” But it topped the charts: Outlaw legends rage in popular culture, fueling brittle fantasies of going out in a blaze of glory. Claudia Joskowicz has taken two of the most enduring of these events—the shootout that killed Butch Cassidy and the Sundance Kid (Harry Longabaugh) in 1908, and the assassination of Che Guevara in 1967—and restaged them as eerie tableaux vivants. That these incidents took place in her home country of Bolivia has contributed to the romanticization of a state whose remoteness lends it a frontierlike liminality. Vallegrande, 1967 (all works 2010), the Guevara film, consists of a slow zoom from a wide field down to the same concrete laundry where Che’s shirtless body was once laid out. 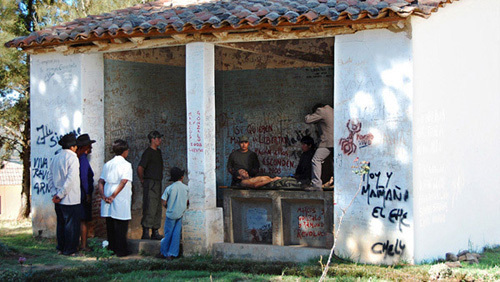 The actors pose in frozen stillness, replicating the familiar image of Che in Christlike state surrounded by soldiers. As Joskowicz’s camera narrows to the scene, it reveals a photographer hovering over the body, his flash interrupting the immobility of the scene as he captures the iconic images of the dead guerrilla, now anachronistically seen amid the graffiti commemorating his death. Where this zoom attempts to show how a mythic narrative is constructed by single, contingent images, the Cassidy film, titled Round and Round and Consumed by Fire, is more oblique, consisting of a slow circular tracking shot of the street where Butch and Sundance holed up for their last stand. Yet this is far from an action scene; instead, police and bandits stand in artificial stillness as the camera slowly loops away to cryptically take in the faraway vista and a nearby donkey. In these reconstructions, Joskowicz portrays sites of history as palimpsests of past and present, in which the total fidelity of the camera to what it sees yields something between the beautiful memory of Young’s song and a remystifying result.